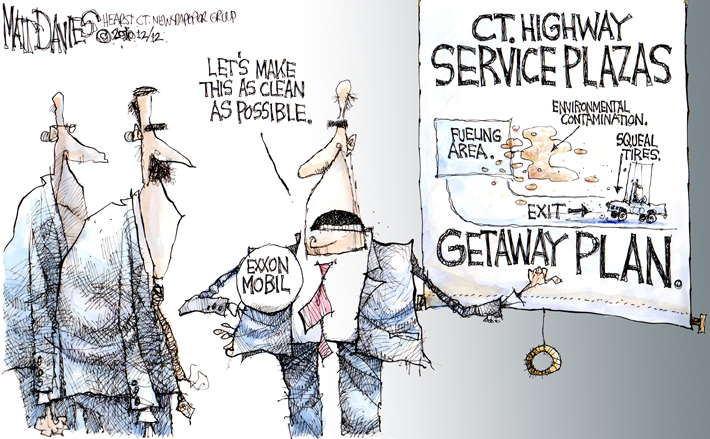 The Exxon Mobil Company has held the lease on CT’s highway rest stops for thirty years. Now they are leaving, the question of who pays for the cleanup caused by leaking fuel storage tanks is, of course, contentious. Until today, it appeared taxpayers were expected to be on the hook. Exxon Mobil must’ve gotten wind that this cartoon was going to appear in Sunday’s paper and simply buckled under the raw humiliation and intense pressure. This entry was posted in Uncategorized and tagged Exxon Mobil. Bookmark the permalink. Isn’t that why they carry insurance???? And Insurance and tanks which leak, mostly due to mishandling, are why gas station business is such a PIA.